Are you experiencing elbow pain? Does it hurt to lift things or hold the steering wheel? Does it hurt to golf or play tennis? How about mousing on your computer or typing on your phone or keyboard?Elbow pain can be caused by a variety of reasons. It can be caused from a traumatic injury but is most often caused by repetitive overuse of the muscles surrounding the elbow. 1. Tennis Elbow or Lateral Epicondylitis. This is an overuse injury to the tendons on the outside of the elbow. It is called Tennis elbow because it is an injury that happens often to tennis players, however. You don’t have to be a tennis player to get this type of sports injury. We use all of those same muscles during the day when we grip excessively (even a book for long periods of time), repetitive cutting, chopping, hammering, mousing, typing, etc. 2. Golfer’s Elbow or Medial Epicondylitis. This is also typically an overuse injury to the muscles and tendons on the inside of the elbow. Although it is a common sports injury of golfer’s, others can also develop this painful condition. 3. Nerve Compression of the Ulnar nerve on the inside of the elbow can also cause elbow pain. This can happen if someone bangs their elbow sharply or rests the elbow in an awkward position that presses on the ulnar nerve, ( such as on the edge of a car window). 5. Arthritis of the elbow joint. This may be accompanied by swelling and heat around the elbow joint. 6. Other miscellaneous causes that are rarer may also be responsible for elbow pain. Whether your pain is caused by a sports injury or simply overuse, the experts physiotherapists at PhysioNow can develop a customized rehabilitation program to help you get your swing back. What are the long term effects of unresolved elbow pain? Long term unresolved elbow pain may result in increased scar tissue, pain and inability to grip effectively. It may cause you to drop things. It may also cause you to have issues develop in the upper arm, or shoulder area as other muscles may try to compensate for the elbow pain. Should I be icing my sore elbow? Traditionally, we have all been told to ice sore or injured areas. However, newer research tells us that this may actually be slowing down our bodies’ ability to heal the injury. Your elbow hurts because of inflammation. Inflammation brings important healing agents to the area to assist with healing. Ice causes the inflammatory agents to move away from the injured area. Initially, it may feel better after icing, However, your body will recognize that the injury is not healed yet, and send more inflammatory agents back into the injured area. This sets the stage for the injury to become more chronic if you routinely ice the area. At PhysioNow, we recommmend icing the area for only the first 48 hours after an injury. After this, we recommend the use of 15-20 minutes of heat to bring blood to the area. This will also bring your bodies’ natural healing agents with it. Can I continue to exercise while getting treatment for my elbow pain? It is recommended that the injured elbow get rest from weght resistance activities while you are undergoing treatment. Stretching frequently is a good idea and encouraged. Your Physiotherapist at PhysioNow will show you the proper stretches and exercises to add when your body is ready for the next stage of progression. We also recommend the use of the “Bandit” elbow brace to help the injured area of your elbow to heal. This speeds up the rest of the tissues and allows for faster healing. Will physiotherapy to treat my elbow pain hurt? Typically, physiotherapy to treat your elbow paid does not hurt. At PhysioNow, we use treatment ultrasound, interferential therapy, massage, stretches and education in the early stages of healing. It may also be helpful to use a tool called “The Hawk”. This can drastically speed up the healing of elbow injuries. Is there a difference between inner and outer elbox pain? 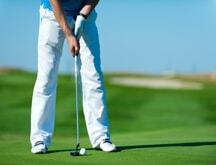 Yes, inner elbow pain is called medial epicondylitis, or golfer’s elbow and is caused by gripping activities. It hurts on the inside part of your elbow. Outer elbow pain, called lateral epicondylitis, or tennis elbow is caused by overusing the upper forearm muscles. All of the muscles of the forearm attach at the elbow on either the inside or outside part of the elbow. When we do activities that overload our body, the pain is felt at the elbow on either the inside or outside. These injuries can easily by treated by Physiotherapy. At PhysioNow, we will get you on the road to recovery quickly! Call Today to get started!